As we work our way west across Canada, heading home from Banff, I’ve been thinking a lot about artwork that uses some aspect of its content as part of its creation–pyrography to create pictures of burned forests, for example. I also heard talks and saw examples at Banff where the resulting artifact, if any, is almost completely opaque to the viewer. Simon Starling, a winner of the UK’s Turner Prize, tore down a shed by a river in Germany, built a boat in the local style to float down the river to the museum where his show was located, and then reconstructed the shed as the exhibit. It’s clear this makes meaning for the artist — but what does it do for the local population? Who is the client for this work — the curator or the viewer? Some artists contend the viewer is not needed to complete the work. Maybe so. But for myself, art isn’t “client-free”, even if it is internally driven. Yesterday I did more work on Crown of Broken Branches. It was pleasurable after a month of tight work to do confident, loose, watercolor on traditional watercolor paper — “respecting the paint” as Tom Hoffman once said I did. I jury-rigged a way to weight the curling edges to a jumble of taped-together boards, since I did not have a board big enough. I decided I did not need to paint to the edges as I usually do, and I would leave the paper as it came off the roll — uneven, an imperfect rectangle — to reinforce the aesthetic liberation I was feeling. 50 x ~36. This one will get finished at home. But after an exit interview, the afternoon opening of our group show (see December 15), an artist talk by sound artist Gary James Joynes, and dinner with the family and remaining artists, I was completely derailed. I’m well and done, my mind is no longer focusing on the art, it’s turned its jangling neurons to logistics, travel, and the looming holidays I’ve managed to ignore up until now. Luckily I have Jonelle Johnson’s weekly watermedia group as my home community to which I return. I’ve only really got one more work day left. At first I reached for a regular full watercolor sheet, but then I stopped. “What am I thinking?! This is my last opportunity to work big!” So I muscled a large piece of Arches watercolor paper off the roll. It fights back ; – ) but I devised a complicated set of weights and clips to hold it in place. 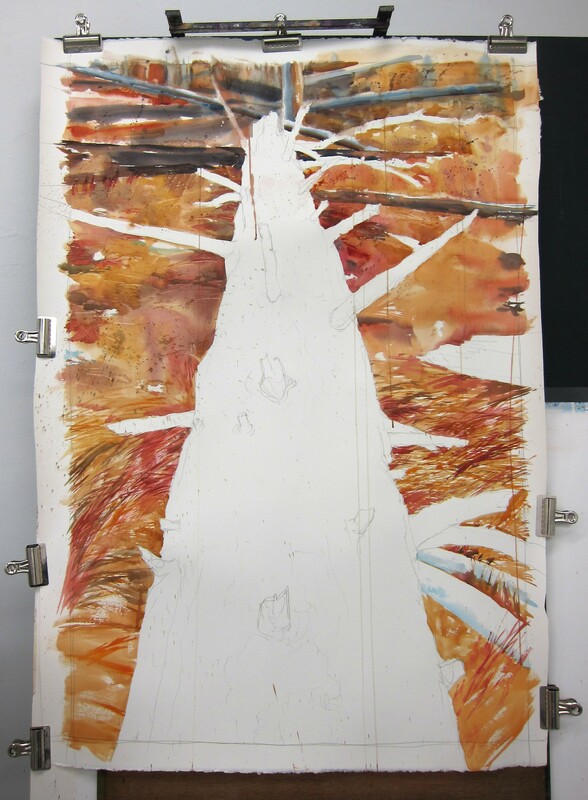 The drawing of a burned, downed log receding into near space looks like a crucifixion. Maybe this is not such a bad metaphor. Last night the “self-directed” residents met for a farewell beer at the Banff Avenue Brewing Company. Convivial and amusing! 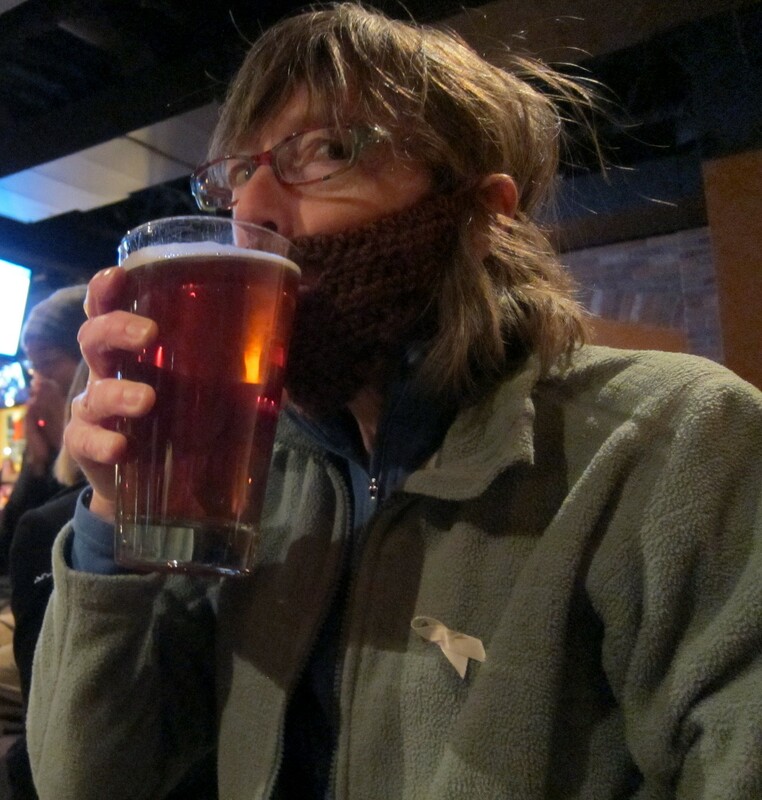 I am drinking a raspberry blonde beer through the “beard” that Ila Crawford crocheted for me. 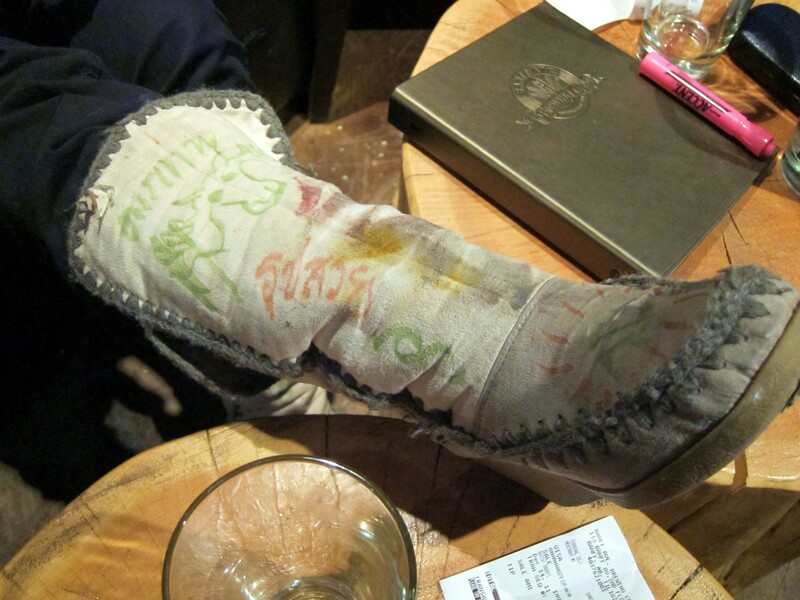 Since Laura Hohlwein’s boots had, by virtue of splatters, become painting shoes, we autographed them. As time draws short, it seems ever-more important to keep experimenting while I have all this space. (Must be 5 times the size of my workspace at home!) I tweaked After the First Death a little, but spent most of the day on a paper construction I’m calling The Fire This Time. Alas, I don’t count it as a visual success, but I derive sufficient procedural and conceptual interest to try it again. I want to contrast our idealized images of trees with the reality of burned ones; and of course, paper is made from trees — at least high-quality heavy paper like watercolor paper is. I’m reminded of my friend Karen Rudd’s cedar stumps painstakingly constructed of corrugated cardboard. I see a lot of “recursive” artwork around here — objects where the creation process recapitulates the meaning of the work in some way. 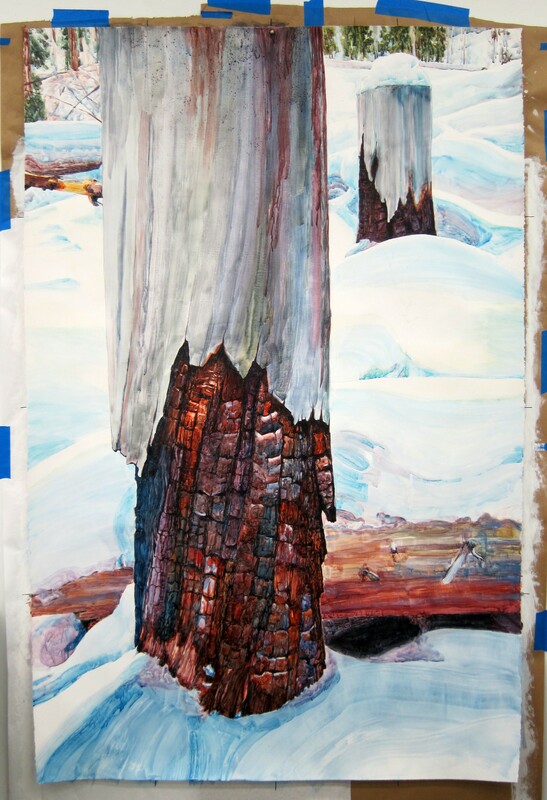 I decided to change the name of the second large paintings from the Stanley Glacier Trail. I called it Fire-Scarred Base before, but the alliteration of Burned at the Base seems simpler and clearer. I made a lot of progress over the last two days, and coming back to it fresh tomorrow should tell me if it’s done. Friday was the last of the music residents’ concerts of the year and as always it was outstanding. I heard a visiting Celtic rock-and-roll band the next night and while it was enjoyable, it was a shock to realize what complex and sublime music I had been become habituated to hearing. Most of the thematic residents left Friday or Saturday and others are beginning to depart in dribs and drabs. It’s becoming very quiet, but also more intimate. Perhaps too jewel-like for the subject matter, but I love those textures. 76 x 51 inches.